In our first blog, we discussed camera modes and how to make the best choice as a forensic photographer. Then, in our most recent blog, we discussed the importance of making good photography choices – camera mode, aperture, shutter speed, and ISO. An equally important, but often overlooked, choice involves something more fundamental: your camera lens. Camera lenses are described by focal length and lens speed. Focal length is the distance in millimeters from the optical center of the lens (when focused at infinity) to the image sensor in the camera. Lens speed is the lens’ largest aperture setting. Depth of field depends on both characteristics. A shorter focal length delivers greater depth of field. A wider aperture lessens depth of field. Camera lenses are classified by focal length as normal, wide angle, telephoto, and zoom. Each has a purpose. For ease of discussion, focal lengths will be discussed relative to a full-frame DSLR image sensor, the direct descendant of the venerable 35mm film camera. Most DSLR cameras used by law enforcement agencies have “cropped sensors” that apply magnification to achieve the same image as a full-frame sensor. Doing the math is beyond the scope of this blog. The focal length of a normal lens is 50mm. It approximates human eye view, making it an essential forensic tool. 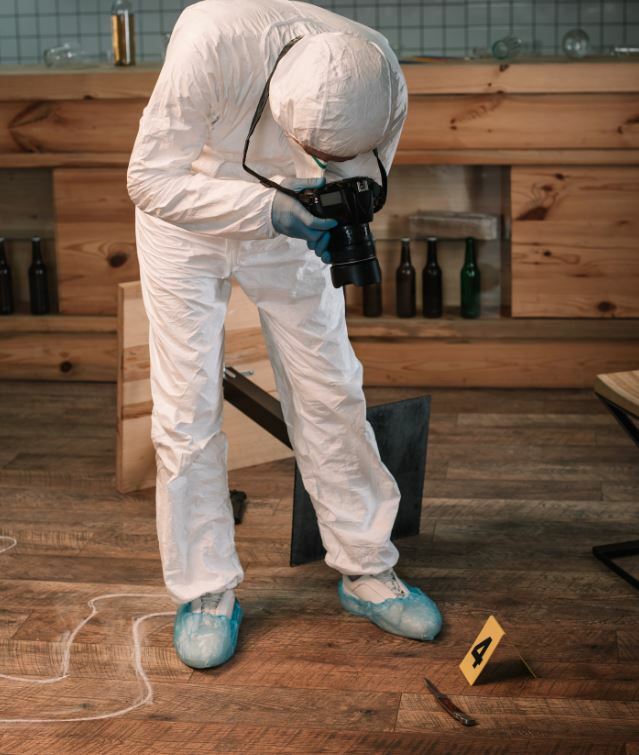 It is not necessary for all forensic photography to be shot with a normal lens; however, it is absolutely essential to use a normal focal length for any photograph intended to accurately depict distances and spatial relationships. A wide angle lens, strictly speaking, is any lens with a focal length less than 50mm. Common wide angle focal lengths start at 35mm and trend downward. Wide angle camera lenses are valuable for tight spaces and showing a wider field of view than possible with a normal lens. They also provide greater depth of field. But as we’ve discussed before, every advantage in photography comes at a price. The price for a wider field of view is distance distortion: objects may appear farther away than they actually are. Telephoto lenses are at the other end of the spectrum in every sense. Their focal lengths are greater than 50mm, they show a narrower field of view than a normal lens, and they provide less depth of field. Their advantage is in bringing distant objects closer to the viewer; however, this effect tends to compress distances between all objects in the photograph. Zoom lenses are often mistaken for telephoto lenses. A true zoom – or variable focal length – lens provides a range of focal lengths. This range may span the full spectrum from wide angle to normal to telephoto, or any subset of the spectrum. Focus is maintained throughout the zoom. Distance distortions inherent in non-normal focal lengths are exhibited predictably. There is no requirement to shoot a crime scene entirely with a normal camera lens in order to produce a “true and accurate” representation. Normal focal length is essential for properly depicting distances, but wide angle, telephoto, and macro (which will be discussed in a future blog) lenses are also useful tools. OSCR360 is a perfect illustration of this concept – the capture kit employs paired hemispherical (wide angle) lenses to capture a complete spherical representation of a scene from the viewer’s perspective. The presentation software then uses the spherical images as containers and context for normal and close-up photos (among other things). 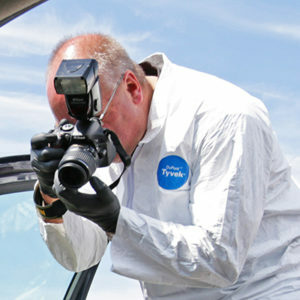 L-Tron’s Forensic Photography Refresher Course is a full day review of forensic photographic techniques, camera settings, and more. Contact us to learn more about our upcoming courses or visit https://www.L-Tron.com/course. Andy McNeill is a retired Sheriff’s Deputy and L-Tron’s Director of Forensic Education. With over 20 years of experience in Law Enforcement, Andy is an ACTAR-accredited collision reconstructionist, IAI-certified Senior Crime Scene Analyst, and a NYS-certified police instructor. In his spare time, Andy enjoys kickboxing, traveling and photography.